Andy Rathbone » Why does Windows show my file names in blue letters? Why does Windows show my file names in blue letters? Q: I just noticed that some of my file names have changed to a bluish color in Windows Explorer. They still seem to work okay, but the names are in blue letters. I’ve seen this before, but it was always just one file. This time all the files in one of my folders have changed to blue. What happened? 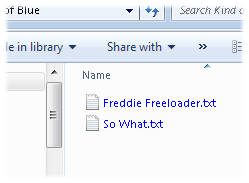 In your case, Windows shows the names in blue to tell you that the files are compressed: compacted to save space. Windows decompresses them automatically when you open them, so you probably won’t even notice the slight delay. Microsoft added automatic compression to Windows more than a decade ago. Back then, when large hard drives were expensive, compression made sense. By compressing everything on your drive, you could cram more files onto it. Hard drives cost much less, and they’re enormous compared to the tiny drives of yesteryear. Your largest files today — the ones holding digital music, photos, and movies — come packaged in a format that’s already compressed. Telling Windows to compress them again won’t save much space, if any. Compressing files make them more difficult to retrieve should your hard drive crash. 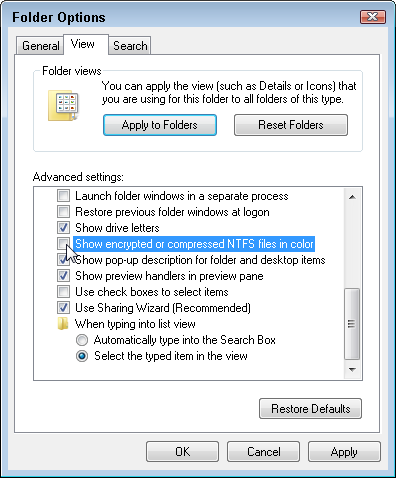 Right-click the folder (or your drive’s icon) containing the blue files and choose Properties from the pop-up menu. After unchecking the compression checkbox (shown below), click the OK button. After a moment (or a long time, if you’re decompressing your entire drive), Windows will finish decompressing the files, and the blue letters will return to their normal black. Click the Start button and open Computer. Click the Organize button, choose Folder and Search Options from the drop-down menu, and click the View tab. After unchecking the checkbox (shown below), click the OK button. Whether you turn off compression entirely or simply turn off the blue names, your file names will return to normal color. Posted: February 6th, 2012 under Windows 7, Windows Vista, Windows XP. I just thought I would drop you a line. I can’t remember how many weeks it has been – but you helped me with Windows showing my files in blue letters (after I had decompressed everything). Well it just occurred to me this morning – that this no longer happens. I have no idea why or when it stopped (it’s like you never notice when a headache goes away…) but all my files are perfectly black – and I no longer have to do anything to them. Susie — Glad to hear that it’s worked out for you, no matter what way. Thanks Andy. Worked great. So easy. Hi Andy, I have the same problem but compress drive to save disk space is not selected. A PC tech worked on my PC the day the blue files appeared. Could he have done something to my files? Nicky, you should probably ask the PC tech what happened. thank u very much it help me big bro!! nice job!! Thanks for solving the problem. thanks for solvint the problem, i wait for next time. Glad I checked this out before I filled my entire 1 Terabyte driive with compressed files. Only one folder copied over before I realized the mistake. (Thanks to You) Uncompressed speeds things up too. One little check box – Damn! Hello. I have the same blue file name problem as the others in here, however, I never changed the settings to do this. Every file and folder on my system is blue, and I notice the check box is checked to compress. Again, I never elected to do this. I’m puzzled. Red: Try removing the checkmark to see if your files resume to normal. If I copy blue files onto another hard drive, will they still be compressed? 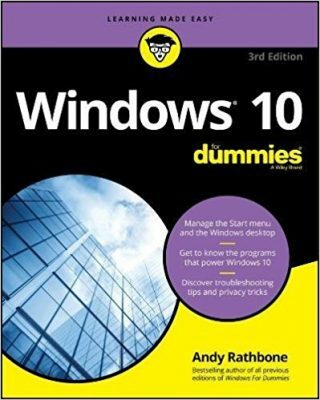 I need to move them from an XP computer to a Windows 7 computer, and many necessary data files are in Program Files or Documents and Settings. Dave: The answer depends on how your new PC is set up. Try copying one file over and see if it stays compressed (blue). That will give you the answer. NOT SHOUTING, RETIRED I AM..
Bless you for posting this – it’s been annoying me for ages! The 2nd solution helped me with the folder options. WHEW! Funny how a little thing like different colored files can drive someone bananas. LOL. 🙂 Thank you so much!! Thanks a lot. I get relief from blue color..Thanks again. Thanks. it help a lot. 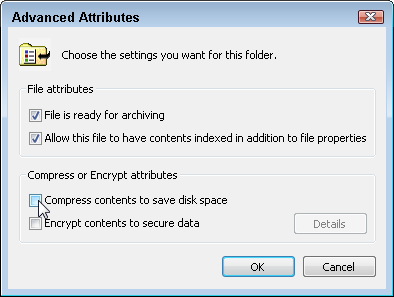 When uncheck both options from Compress and Encrypted attributes, is there any data loss while decrypting and decompressing. Hruday: No, decompressing and decrypting a compressed and encrypted file shouldn’t cause any data loss. It’s terrific when I can simply Google a problem I am having and find an excellent article like yours to fix an annoyance promptly. I did compress my files recently and half of the files were in blue and half in black. Now they are all in black as I wanted. Thanks for your help. Lisa: I don’t have any explanation as to how the folders were originally compressed. You might check the folder’s modification date to get an idea of when the compression occurred. That might provide clues. thanks….it helped me to recognise and solve the issue. Its easy and done now. Cheryl, that issue seems unrelated. I’m not sure of its cause.